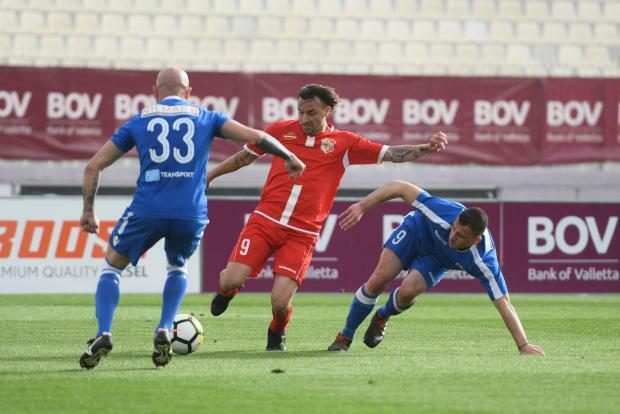 The BOV Premier League relegation battle reaches its decisive end this evening when Mosta, St Andrews, Tarxien Rainbows and Naxxar Lions will look to avoid from joining Lija Athletic in Division One next season. Stay with us on timesofmalta.com as we are providing live commentary of what is happening in all three relegation matches - Mosta vs Sliema Wanderers, Tarxien Rainbows vs St Andrews and Senglea Athletic vs Naxxar Lions. 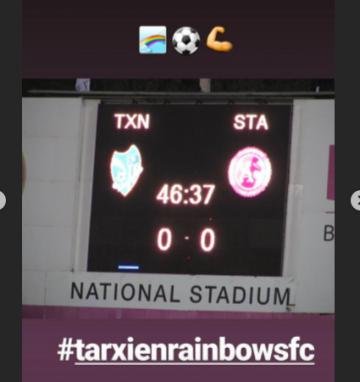 - Tarxien Rainbows vs St Andrews 0-0 (Tarxien to face Żejtun in the play-off while the Saints will stay in the Premier League). - Sliema Wanderers vs Mosta 0-1 (Mosta maintain their top-flight status). Meanwhile, we invite you tomorrow to stay tuned to our website as we will bring live commentary from the matches which will decide the championship; Balzan vs Hibernians and Valletta vs Gżira United. 8.58pm Here are the final standings as the relegation discourse has come to an end! 8.57pm Mosta have also managed to stay in the top-flight after overcoming Sliema by a goal to nil, scored in the first half. This was their first win since January, when they defeated Tarxien Rainbows. 8.55pm 0-0 at the National Stadium between Tarxien Rainbows and St Andrews. A result which condemns Naxxar to Division One while forces the Rainbows to meet Żejtun Corinthians in the promotion/relegation play-off. Meanwhile, the Saints have preserved their Premier League status for yet another year. 8.53pm It's finished at the Centenary Stadium..as Naxxar defeated Senglea 3-0, but it may not be enough for them to stay up. 8.48pm We are into the final minutes of the games...surely there won't be anymore twists in the tale. 8.35pm ...and here is Naxxar's double through Messias again, who struck a free-kick from the edge of the box. 8.33pm Here is Naxxar's first goal against Senglea, courtesy of a spectacular volley by Yuri Messias! 8.24pm While they are anxiously waiting for news from the National Stadium, Naxxar are still leading Senglea by three goals to nil. 8.21pm Directly from Tarxien's social media...a 0-0 draw would not be enough to guarantee them automatic salvation! 8.15pm The Wanderers had a strong reaction after the break, Qeros’s teasing cross from a free-kick was met by Milinceanu who sent his attempt against the foot of the post, as Sliema are striving to level terms against Mosta. 8.12pm Two minutes into the second half, Kevaughn Atkinson of St Andrews brought the best out of goalkeeper Andrea Cassar with a freekick from the right which was turned into a corner in style by the Tarxien goalkeeper. 8.10pm A shot from the game held at the Corradino Stadium, between Sliema Wanderers and Mosta. 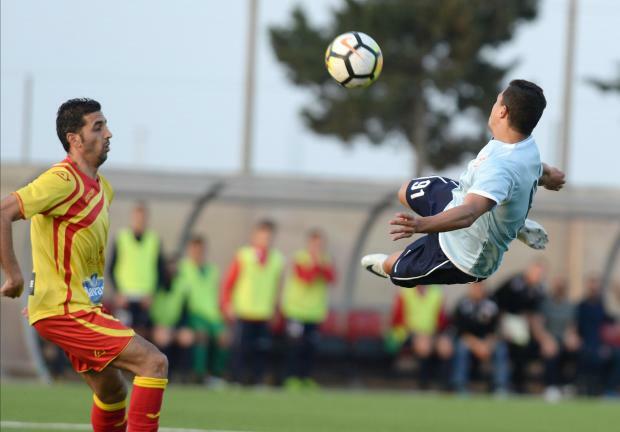 - Tarxien Rainbows vs St Andrews 0-0 (St Andrews would keep their place in the top-flight while the Rainbows would be forced to face Żejtun Corinthians in the play-off). 7.48pm Just before half-time, Mosta clicked into gear and opened the score against Sliema! 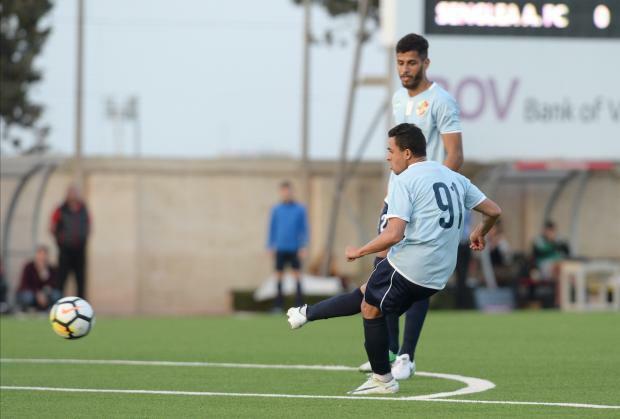 Mosta broke the deadlock when Thomas Veronese sliced open the Sliema defence to find a gap for Giovanni Trovade whose serving shot arrowed into the far top corner. A win would definitely see them salvage their Premier League status! 7.38pm Tarxien were denied by another crossbar when Sean Cipriott attempted a cross which turned into an intriguing shot but it struck the woodwork before danger was cleared away. 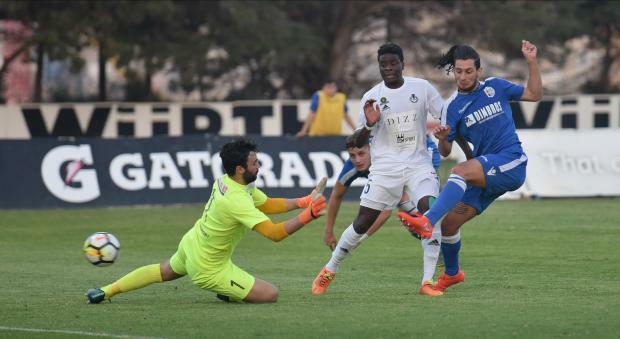 Tarxien, St Andrews still sharing spoils in a goalless stalemate. 7.35pm Naxxar seem to have all but wrapped up the match as they added a third goal. On 33 minutes, Bustos delivery from a corner found Manolito Micallef who headed home. 7.30pm Sliema's Kilan Ameli is proving a thorn in Mosta's defence with his sprightly movement on the right. On one occasion, the winger outfoxed Tyrone Farrugia but his shot was blocked in corner. Frenci Qeros delivering an inviting cross into the goalmouth but Ameli headed wide. Sliema and Mosta are still locked at 0-0. 7.18pm Tarxien almost drew first blood as Eduard Calin saw his free-kick hitting the woodwork. Still 0-0 at the National Stadium. 7.15pm Naxxar could not have had a better start to their game as they double their lead! Messias struck again when the Lions were awarded a free-kick on the edge of the area and the Brazilian curled the ball past Jurgen Borg. 7.14pm After nine minutes, Mosta made a lively start to the match but Giovanni Trovade's freekick went over the bar..
7.12pm However, as things stand, Naxxar would still drop into Division One...but there is still time for something to happen in the other venues! 7.11pm What a start from Naxxar! They have scored inside seven minutes against Senglea. Daniel Bustos's long pass found Yuri Messias who turned past Steve Bonnici with his first effort being blocked by Jurgen Borg. From the rebound, the Brazilian acrobattically volleyed the ball into the far net. 7.00pm All three matches in three different venues have kicked-off right now..
6.59pm Meanwhile, the follow is the players who will line up for Mosta from the first whistle as they take on Sliema..
A. Vella; G. Trovade; M. Sammartino; T. Veronese; I. Maric; D. Nworah; T. Farrugia; K. Frendo; D. Xuereb; Z. Brincat; M. Soare. 6.56pm Here are the starting players chosen by Jose Borg as Tarxien face St Andrews..
A. Cassar; G. Aquilina; E. Baker; E. Calin; S. Cipriott; S. Radovanovic; R. Faria; A. Scicluna; S. Tounkara; B. Traore; L. Grech. 6.54pm Naxxar have been doing a brilliant job on social media, engaging with their fans and inviting them to back their side on the biggest game of the season! 6.50pm Elsewhere, Naxxar Lions will face Senglea Athletic. Here is the starting XI for the Lions..
6.45pm Tarxien, on their part, have no selection problems and coach Jose Borg is hopeful his players will maintain their impressive form of late which saw them beat league leaders Balzan 3-1 and hold Hibernians 2-2 in their last two outings. “This is a must-win match for us,” Borg, who will be facing his former club, said. “We knew from some time that our final match against St Andrews would be a decisive fixture for our ambitions of keeping our place in the Premier League. “There is no doubt that the positive results attained against Balzan and Hibernians have put us in a better position. In fact, if we lose to St Andrews and Naxxar beat Senglea we would have another opportunity as we would fact the Lions in a play-off. St Andrews' starting line-up against Tarxien Rainbows. 6.41pm St Andrews and Tarxien Rainbows will go head to head in a direct relegation duel. The Saints, buoyed by last week’s stunning 2-1 win over Birkirkara, are on the 23-point mark, one ahead of the in-form Tarxien and need just a draw from today’s match to secure their top flight status for another season. Still, Joseph Farrugia, who took charge of the team alongside Michael Woods midway through the season, said that his team had little room for calculations and will go out for maximum spoils. “This season has been a long and hard journey for us with several difficult moments,” Farrugia said. “When Michael Woods and I were handed the reins of the side, we only had six points to show for our efforts. 6.35pm Let's take a look at the current standings before we head to action! All four teams are bracketed inside four points.